Optimizing your social media content strategy is highly effective for increasing brand awareness. Social media is undeniably becoming one of the best strategies for digital marketing. If your business is not utilizing this hugely profitable source, you are missing out on some incredible opportunity. All business, whether new or established, can benefit from social media for many reasons. Some benefits include: cost-effective, increases traffic to your website, allows you to engage with customers easier, and overall increases brand awareness and loyalty. 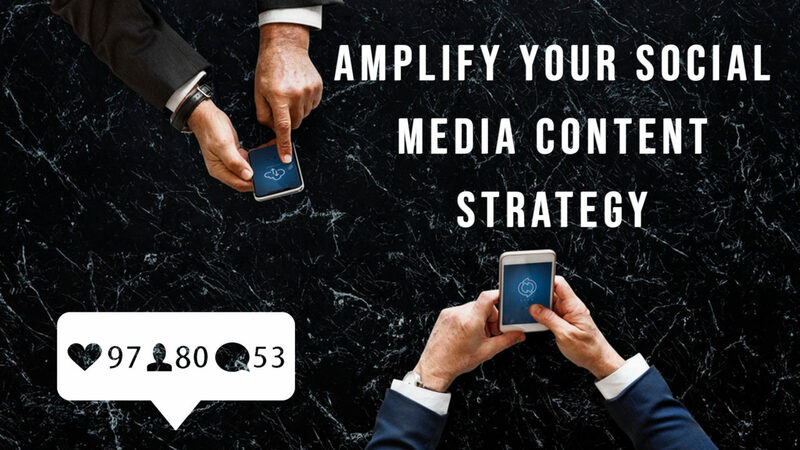 Here are some tips to amplify to your social media content strategy! Social media is constantly evolving and can be difficult to keep up with. Where’s the best place to find out the latest trends and social news? You got it- SOCIAL MEDIA! You can start by searching popular hashtags to see what people are talking about. Utilize those hashtags you just searched and pinpoint some of the most active people using those popular hashtags. What are they talking about and are other users engaging with them? Join the conversation to get the most out of what you are learning from others. Additionally, consider what other bloggers and news sites are talking about. Some of it may not be the best quality information, however, if you notice that the same topic is popping up on many different sites in your industry, chances are that it is trending. While it is important to stay trendy in your industry of expertise, do not just hop on a trend for the sake of staying trendy. Strategically engage your company with trends that are relevant to your company. Today, algorithms are dominating social media platforms. Social media algorithms sort posts on a users feed based on relevancy rather than the time they were published. Therefore, it is so important to understand the content that your audience is engaging with so you can gear your content to their interests. This will ensure that you stay top of mind to your audience and your posts will never get lost in the overcrowded online world. These 3 terms should be priority when trying to boost audience engagement: Quality, Frequency and Follow-Up. These days, it seems as though many businesses are pushing content by publishing more and more. What these businesses do not realize is that eventually, they are going to hit the point of diminishing returns. Most users value quality over quantity. Publishing high-quality content is what will make your work break through the noisy online world. Frequency is also very important. Publishing high-quality content on a regular, consistent basis will keep users interested and engaged with your business. Last, but equally important, follow up with your content. After publishing, look to see who is commenting, liking, and sharing your content. Join in on the conversation and show your audience that you are approachable and reachable. What better way to engage with your audience than to answer their biggest concerns? This is also an effective way to build relationships and gain their trust. In order to successfully do this, first identify audience member’s most troubling questions and confirm that you completely understand their concerns. Second, identify where you and your business can best stay relevant. In other words, only answer questions where your company has expert knowledge. Do not spread yourself thin and attempt to answer anything that you might be unsure of. Lastly, research how other companies attempted to answer these questions. Answer to yourself, how can I explain this better? Put your company’s unique spin on it and give your honest opinion. The key to this is not to just provide an answer or a simple solution, but to provide the best answer. However, remember that it is easy to spot when there is too much ‘fluff’ and this, in turn, can tarnish your credibility. Influencer marketing is a topic on its own. It is so important because it can increase brand awareness, provide a boost in social impressions, and build your following. Building trust with prospective clients should be a top priority for any agency. People trust these experts, which in turn, means that they will trust your content as well. Not sure where to find the perfect influencer for your brand and agency? Dive deep into your niche and make a list of leaders and experts that your audience is engaging with and following. Narrow down on that list by analyzing their reach, their relevance, and their engagement with their audience. Once you’ve narrowed it down, focus on building relationships and trust with those influencers. Many businesses miss out on a ton of opportunity to reach out to a larger audience without even realizing it. Do not sell yourself short and have all of your hard work go to waste by simply hitting ‘publish’ and thinking that you are done. Amplify your social media content strategy by taking your promotions to the next level. The easiest solution to this is to optimize social sharing by placing social sharing buttons to your websites. However, do not simply just slap icons onto your pages, instead, put a little strategy behind it. Focus on the platforms that your audience is engaging with most and encourage readers to spread the word. Research demographics of your audience and find out what platforms they are utilizing and what sort of information they are engaging with and sharing. For example, if your target market is Millennials, understand that they will be engaging more on Instagram than they are Facebook. Also, confirm that the sharing text and image matches the article. Feeling motivated and want to take it a step further? Turn your social sharing buttons into social proof by displaying how many times it was shared. Most people trust recommendations that come from their peers. Displaying this number will entice others to share it as well. As a final tip, if an audience member shares a post or page of yours, take the time to thank them and deepen customer relationships. Here at ADventure Marketing, we have a group of social media experts that specialize in unique content creation for every need. Don’t hesitate to contact us if you are looking to boost your social media content strategy with a marketing agency that understands.